My time in Cambodia was short; three days is all I had to explore the majestic Angkor Wat and the surrounding temple complex. I had not been able to do much research on the temple complex and really didn’t know where to start. 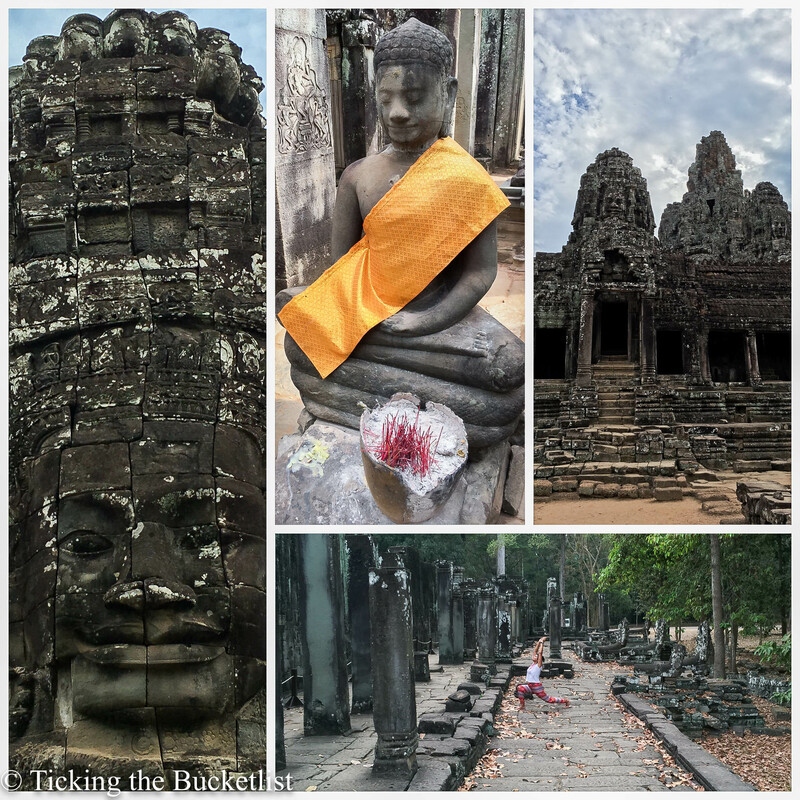 What I knew was that I wanted to see the biggies – Angkor Wat, Angkor Thom (including Bayon) and Ta Prohm. Enigmatic smile of at the Angkor Thom gate…. 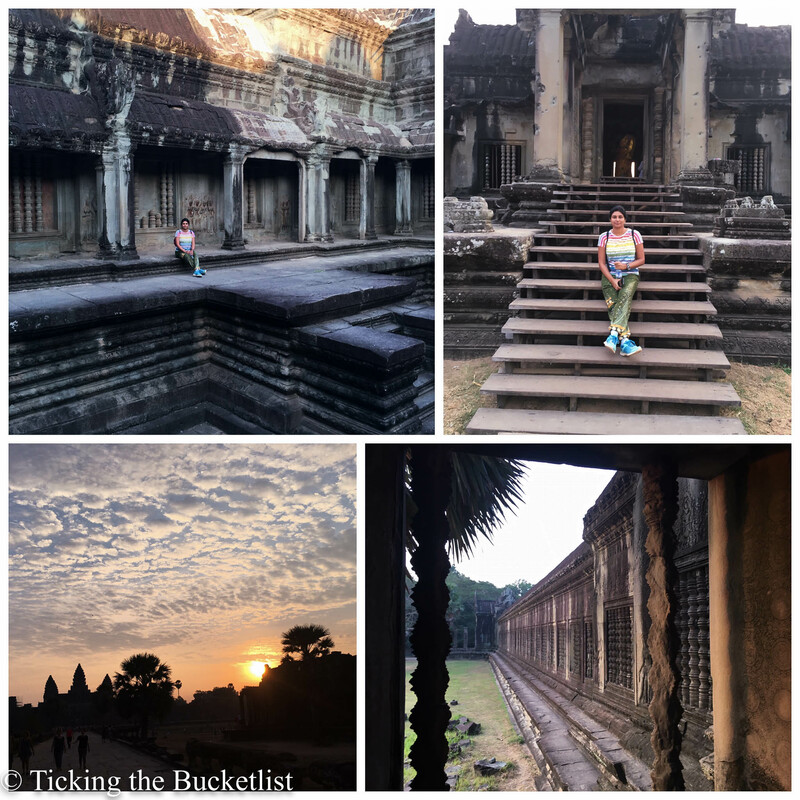 The sunset at Angkor Wat is much raved about and I had that on my list too. 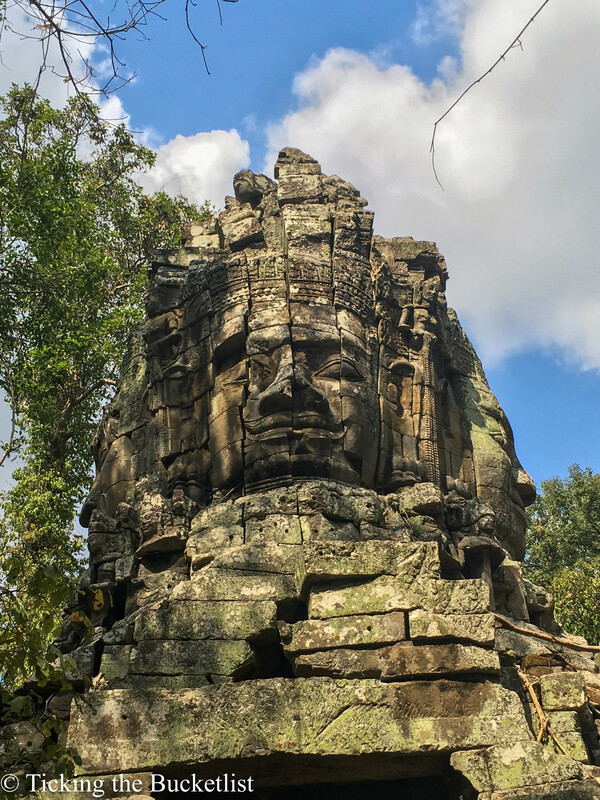 I wanted to visit these sites on my first day in Siem Reap so that I would have enough time to ‘haunt’ any specific temple that caught my fancy. I wanted a guide for all these sites to make me see the hidden ‘treasures’. My requirements fit perfectly in the ‘Angkor Sunrise Discovery‘ tour arranged by Grasshopper Adventures. 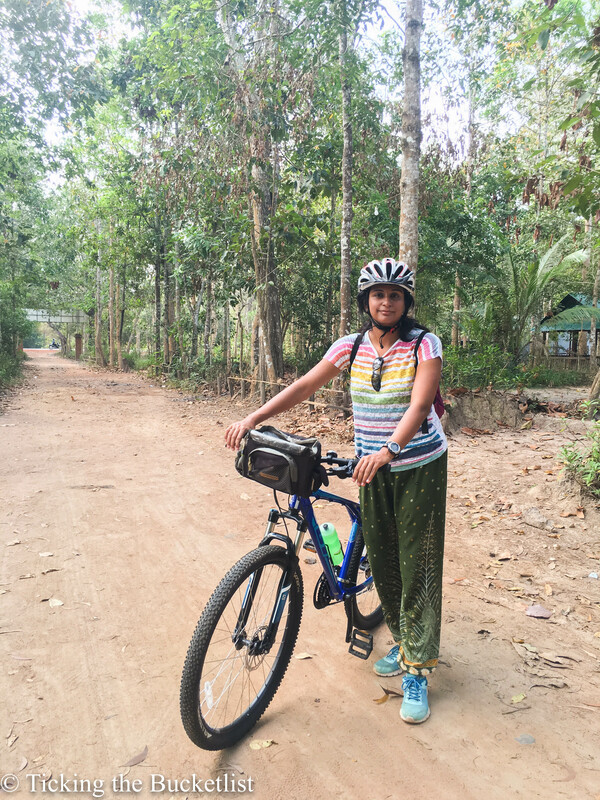 While I wasn’t sure on whether riding a bicycle for 18 km is what I could do, I decided to give it a go as the 18 km was spread over at least 6 hours, making it an average of 3 km per hour, which definitely seemed doable – and it indeed was! Our guide, Sambo, was there at my hostel to pick me up at 4:40 am, as communicated a day prior. Sambo stayed with us throughout the day, sharing information on history, art, architecture, local beliefs and customs. He was eager to share knowledge and his English was good, which made such a lot of difference. To me, the Angkor temple complex without a good guide would simply be a symmetrical building! 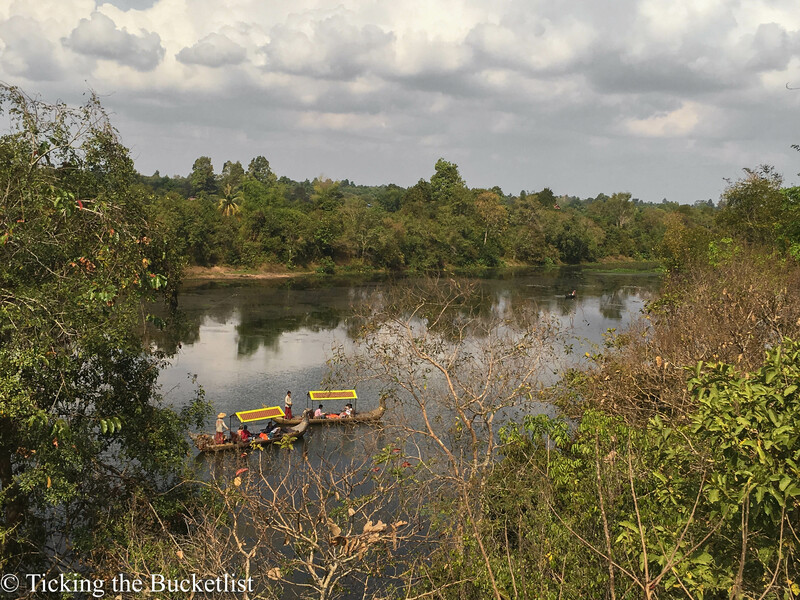 Angkor Wat …explored and explained! I am always keen to meet new people when I travel… that’s what adds all the spice to travelling. I was worried that I might be in a group of over enthusiastic youngsters and might not be able to pedal as vigourously. In the first 30 minutes of the tour, all my worries were put to rest. I had three more people in my travel group, two ladies from the United States of America and one gentleman from South Africa. We had a fun day, especially as we were grouped perfectly – age, physical ability and maturity! Fun times with fun people! Trust me, I really mean this! Tourists flock to the big temples in hordes. It is rare to have a moment to yourself if you follow the touristy path. However, having a cycle and a guide meant we could ride over tracks that tourists don’t even know about! 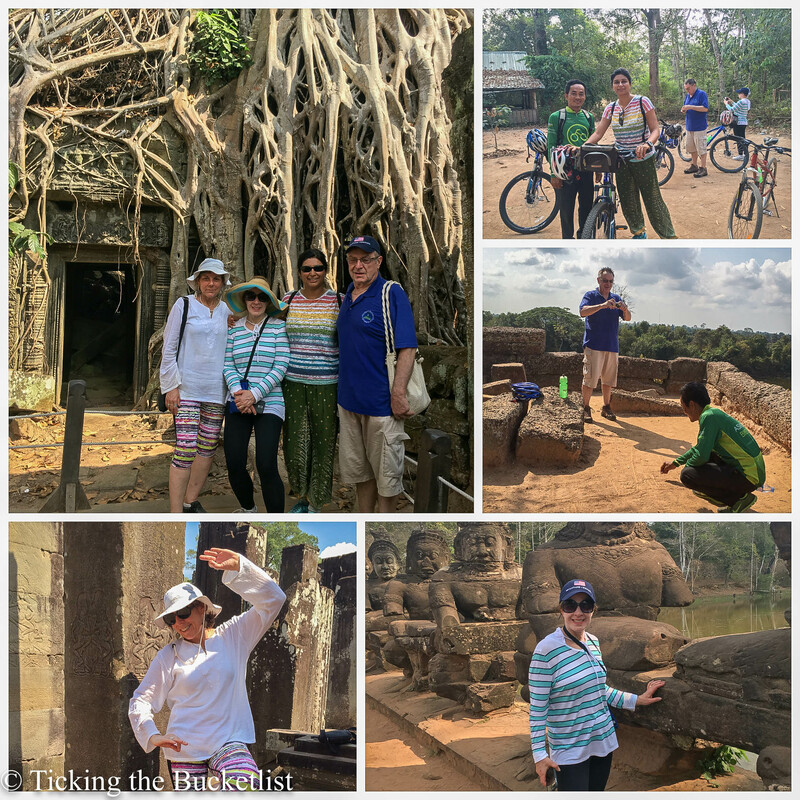 We rode over the walls of Angkor Thom, looking down at the lilies in the moat and acted crazy in front of all the gates and smiled with the smiling faces. 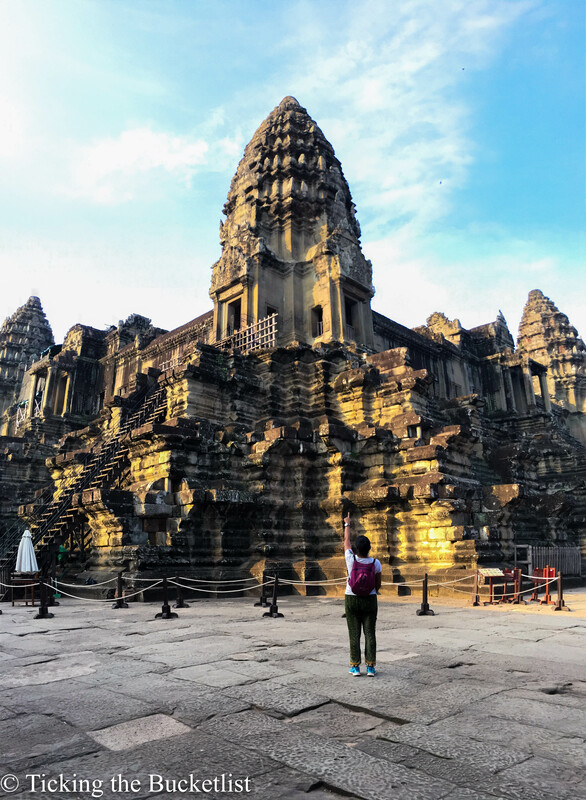 Sambo knew the perfect time to show us around Angkor Wat… just after sunrise, when everyone returns back to their hotel for breakfast. which explains my pictures without people in the background! Peace and quiet…away from everyone else! Unless you have time at hand and choose to visit a local village, you will never come to know what the local Cambodian life is like in the village. We rode into a tiny Cambodian village, saw the stilt houses and heard stories on how life has changed in the past. The country has had a difficult history, which made us appreciate the Cambodian smiles even more! I had been sinning on calorie laden food in Myanmar for a week before arriving in Siem Reap. I needed some way to burn off the extra calories and cycling seemed like a great idea! Well, I burnt the calories, but in an easy fashion and wasn’t ‘dead’ by the end of the day. We cycled along the road and over some dirt tracks. We stopped to click pictures and listen to Sambo, who had a new story to share ever so often! All set with my wheels! Breakfast, mid-day snack and lunch was included in the tour. After witnessing a colourful sunrise and touring the Angkor Wat, we headed towards a quiet spot in the woods for a delicious breakfast. I tanked up on protein with the delicious omelette. For the pure vegetarians, there was bread, butter, jam, peanut butter and chocolate spread. 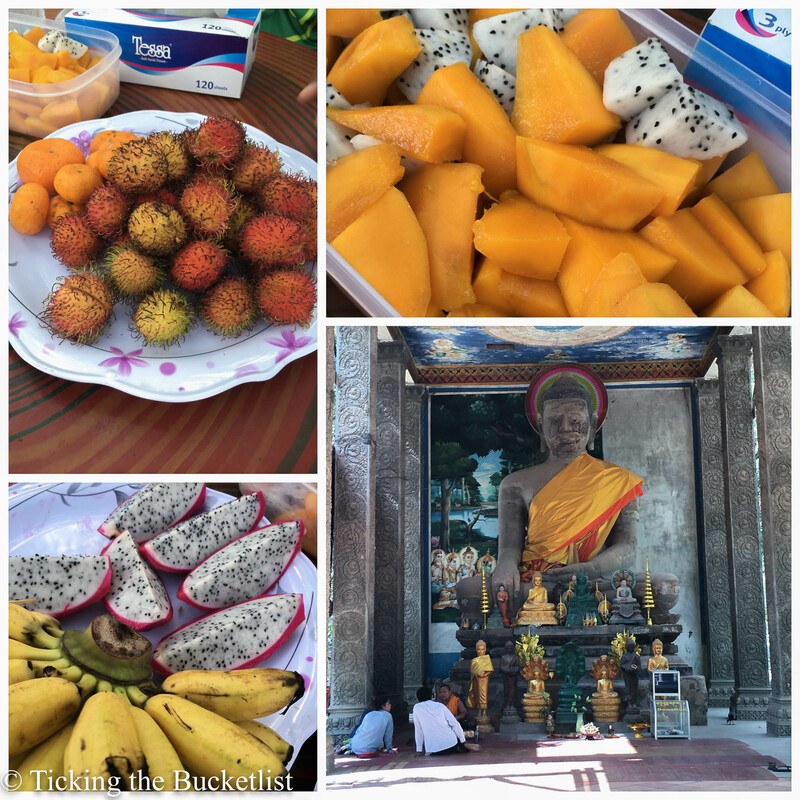 What I liked the most was the local produce – mangoes, dragon fruit and papaya… what a delight! And I got to eat mangoes again…at snack time! Cambodian local food is more than ‘amok’ and ‘curry’. Lunch was included in our tour and I had one of my yummiest meals in Cambodia in a quiet authentic Khmer restaurant. Sambo asked us for our food preference during the day and pre-ordered our meal. 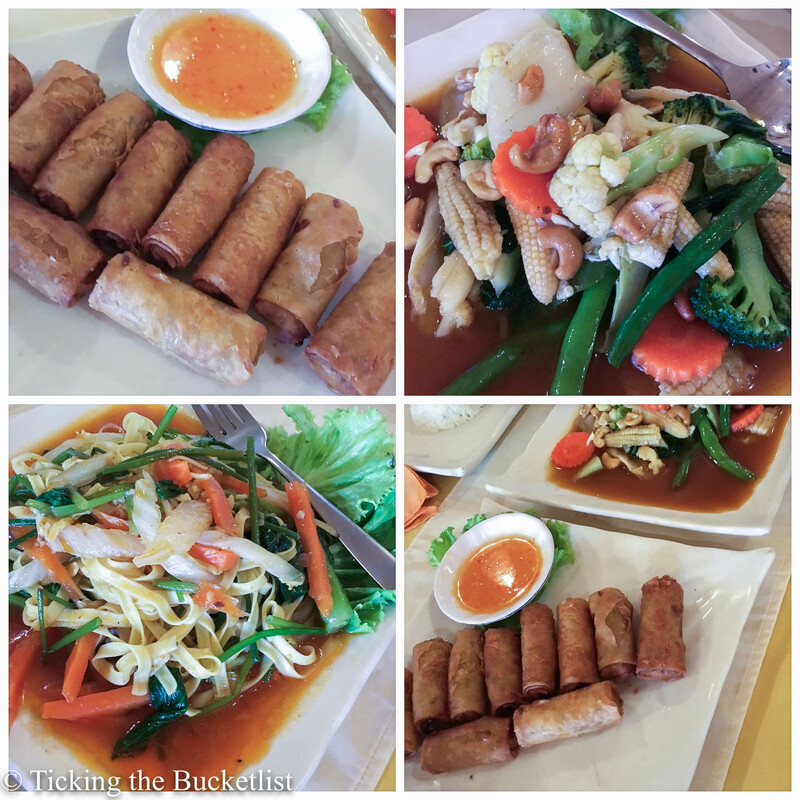 I was delighted to have plenty of vegetarian options – spring rolls, curry, flat noodles and vegetables. We reached the restaurant, washed and cleaned up. Our meal was ready… a piping hot meal with a chilled lemonade after 18 km of cycling… it was the perfect ending to the tour! I would highly recommend this tour if you are comfortable on a bicycle and do not have any knee or join problems. The cycles are with gears and in great condition. We were given helmets and were told when to change gear initially, until we got the hang of things. Cold water was available at all times, which is much needed in hot and humid. The food is well prepared and delicious. Most of all, it was the company and Sambo that made my day full of fun and smiles! It was a lovely trip!